“Rock got reason, rock got no rhyme” – but if you’re a talented young musician or singer, it might well be your time. 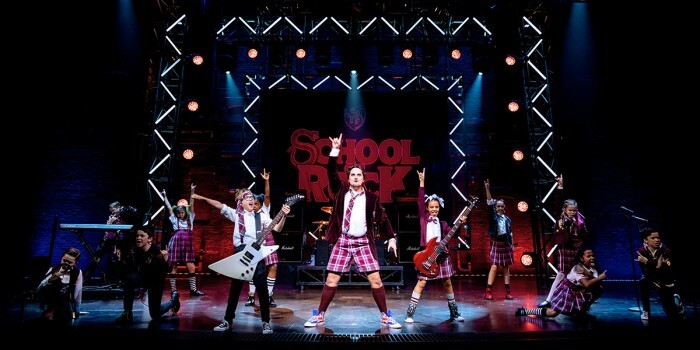 Open auditions to join the kids band of School Of Rock – The Musical are coming to London! Chart-toppers of the future aged 8-12 years old, who can play a rock instrument and/or sing, can audition in London on 17 or 18 October for musicians (guitar, bass, piano, and/or drums), and 13 or 15 November for ensemble roles. Registration and further details can be found by contacting Jessica Ronane Casting via the School Of Rock auditions page. The countrywide search for the latest crop of budding musical talent has most recently visited Plymouth and Manchester, and now comes to London. The show’s original kids cast were the recipients of the Olivier Award for Outstanding Achievement in Music in 2017. So if you’re a pint-sized musical prodigy looking for the opportunity to slam some tunes in the West End, this could be the opportunity for you. Check out what a day in the life of a School Of Rock band member is like. Based on the hit film, School Of Rock – The Musical follows Dewey Finn, a failed, wannabe rock star who decides to earn a few extra bucks by posing as a substitute teacher at a prestigious prep school. There he turns a class of straight-A students into a guitar-shredding, bass-slapping, mind-blowing rock band. The show is currently booking until 20 October 2019 at the Gillian Lynne Theatre.